We did it! 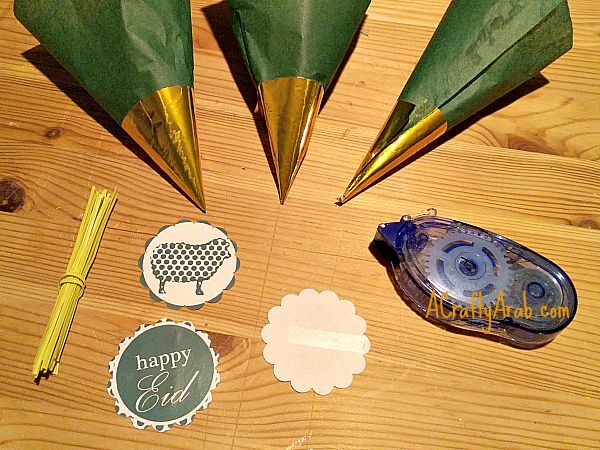 Our household survived another Ramadan with children. We had cheat days, we had looooong days, we had whiney days, we had extra prayer days. You name it, we did it. We adjusted to having an Islamic holy month in a Western culture, in an area with an average of way too many hours of sunshine in July. And did I mention swim team? We’d like to say shukran to those that followed along on Instagram, Pinerest, Twitter, and Facebook. Your comments have been enjoyed and discussed. We are blessed to be surrounded by so many creative, encouraging souls. 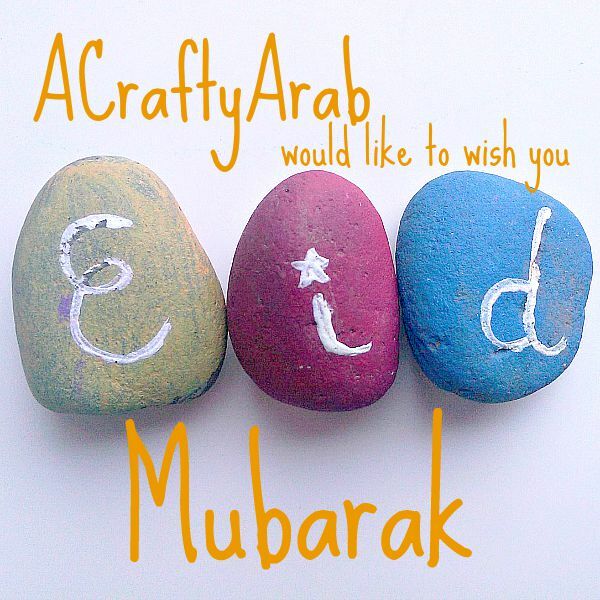 I will do a wrap up for the 2015 30 Day Ramadan Crafty Challenge next week. But now, we plan on unplugging, after a full month of social media (see links above) for the weekend. We hope to visit friends, hike in nature, share desserts, volunteer and just hanging out playing some of the games we made up over the month. 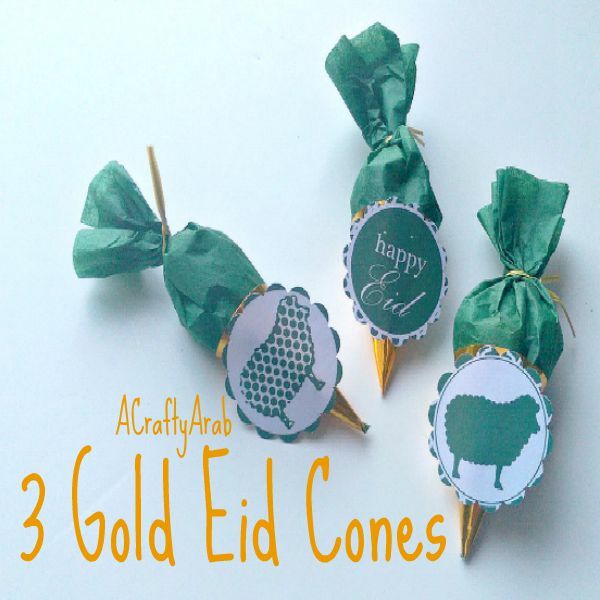 For today, here is a little tutorial that the girls don’t know I made as an extra Eid gift for them. 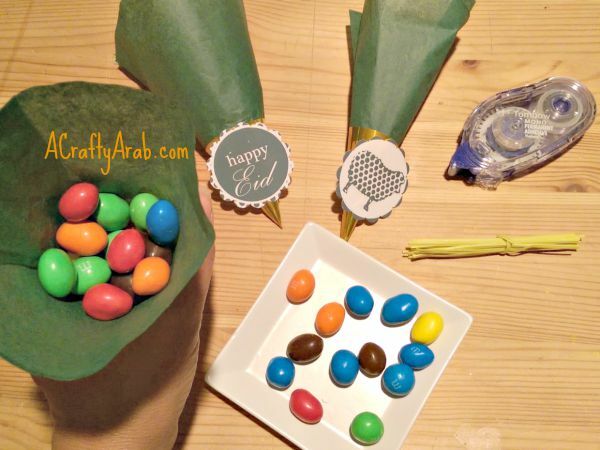 They are little gold and green cones, filled with the most special kind of candy at our house, peanut m&ms. 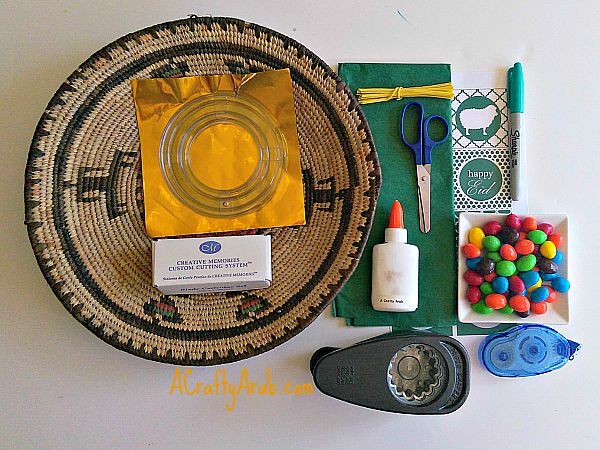 These little treasures will be hidden somewhere on our hike this weekend and the girls will spend some time on a scavenger hunt finding them. 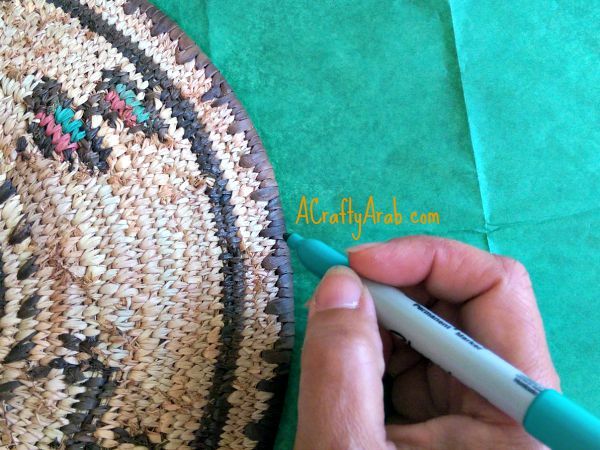 Lay out your tissue paper and place your large basket upside down to trace out a circle. Cut this out. 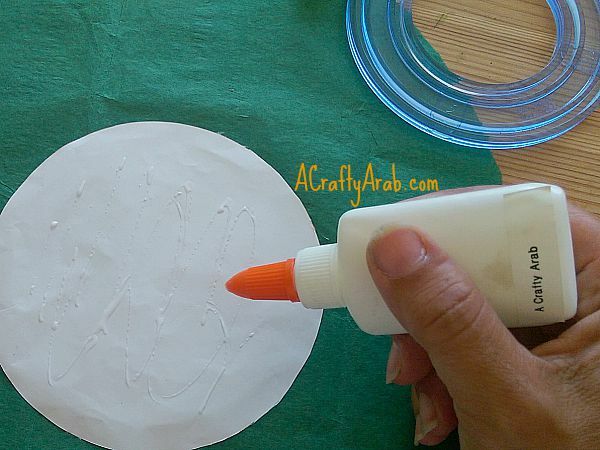 Use the circle template and tool to cut out a smaller circle from the origami paper. 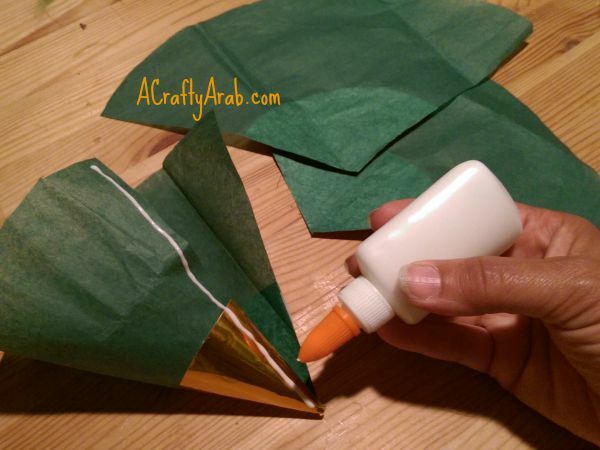 Place a small amount of glue on the back of the origami paper and place it in the center of the tissue paper circle. Our glue seeped through, so we turned our project over so it would not glue down to the table. Let this dry for a few minutes. 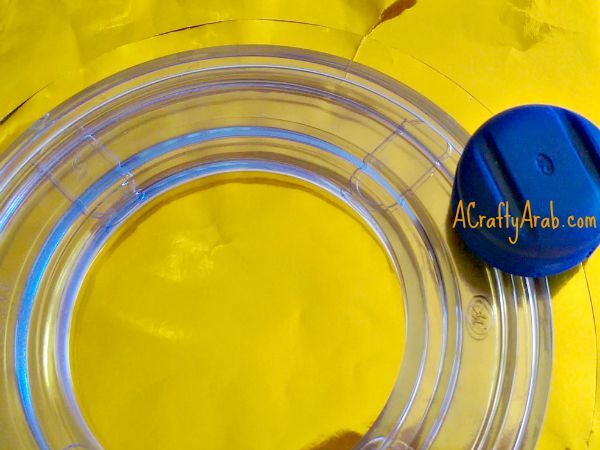 Cut three lines into the circle to the center, making three fan shapes. 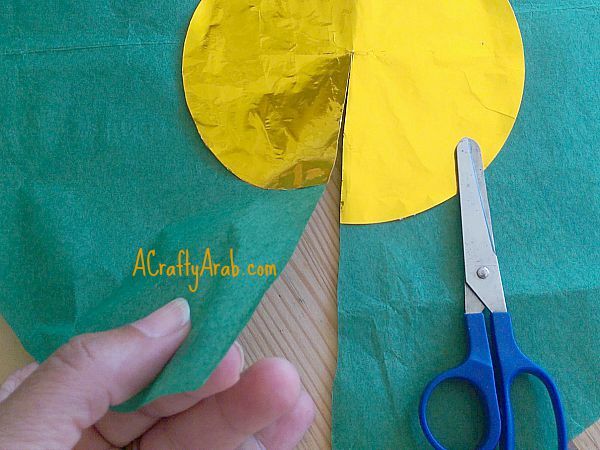 Turn your fan into a cone shape and run one line of glue down a side. close it up and wait for it to dry. 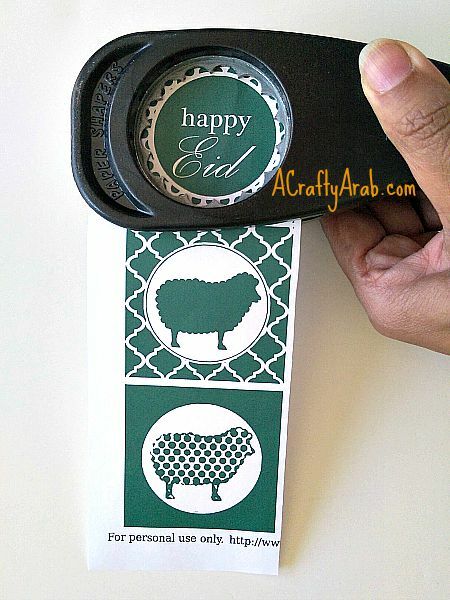 Print out the Green Eid Decorations free pintables and use the floral large punch to cut out your tags. 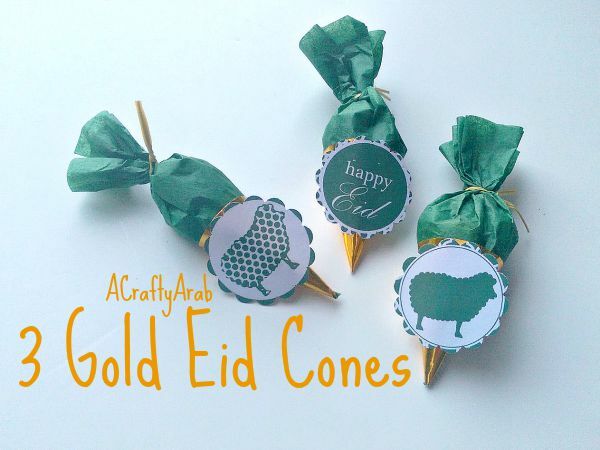 Use the double sided tape on the back side of the tags and add them to the gold part of the cone.